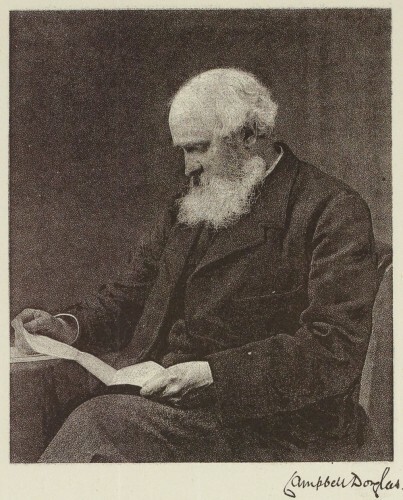 Bio Notes: Campbell Douglas (known as 'Cam' to his family and friends) was born in 1828 at Kilbarchan where his father Robert Douglas was parish minister. His mother was Janet Monteath. Along with the other members of the family he was educated up to university level by his father, and according to his last partner, A N Paterson, attended classes at the University of Glasgow at the age of about 13 or 14. In 1842 he was articled to J T Rochead who had just commenced practice on his own account and in 1843 he 'came out' (left the Established Church) with his father, joining the newly formed Free Church, which was to be one of his most important clients in his early years. In 1847 he left Glasgow to widen his experience at Durham (presumably with Ignatius Bonomi), Liverpool, Brighton and Newcastle-upon-Tyne where he worked for John Dobson; and according to the biographical note in 'Quiz' he also spent some time in Ireland. In 1855 or 1856 he returned to Glasgow to set up practice but in his earliest years his practice was mainly in Fife, his elder brother Robert having set up business as an iron founder and mechanical engineer in Cupar in 1846, and in Kirkcaldy in 1854. The practice came into national prominence with the commission for the Scots Gothic Briggate Free Church in Glasgow and the competition win for the tall-spired North Leith Free Church, memorable for its elaborate tracery, in 1859. A marked tendency to attract the best draughtsmen on the market began with the recruitment of Bruce Jones Talbert at around the same date. In the autumn of 1860 Campbell Douglas took into partnership John James Stevenson and shortly thereafter an Edinburgh branch office was opened at 24 George Street where the top floor of the Edinburgh Life Building was shared with the stained glass artist and decorator Daniel Cottier, an arrangement which lasted until about 1865. Douglas had known Stevenson since about 1852, Stevenson and Douglas’s brother Carstairs Douglas having shared a flat as divinity students. In August 1856 Stevenson, then still pursuing his parents’ wish that he should become a Free Church minister, had invited Douglas to Augsburg where the principle of a partnership was agreed once Stevenson had completed an articled apprenticeship. From Douglas’s point of view this unusual proposition held considerable promise as the Stevensons were wealthy and had close business links with the even wealthier Tennants. Born in Glasgow on 24 August 1831 Stevenson was the sixth of the ten children of James Stevenson, then a Glasgow cotton trader. James had moved to Jarrow in 1843 to found the Jarrow Chemical Works in which the Tennants were minority shareholders. His sons James Cochrane, Alexander and Archibald had joined him in the business, taking over its management when their father retired to Edinburgh in 1854. John James had been intended for the church from his early years and he had been sent to the University of Glasgow in 1845-48 in preparation for Edinburgh’s Free College in 1851-54. That had included study in Tubingen in 1853 and followed by further study in France, Sardinia and Italy. Throughout his continental studies Stevenson had pursued a parallel interest in architecture and with his father’s consent he had begun a two year apprenticeship with David Bryce in January 1857, followed by a further two years’ experience in George Gilbert Scott’s office in London. Although the Briggate and North Leith Church, and still more excellent Scots Baronial Hartfield showed that Campbell Douglas had real ability he was thereafter content to take on a more managerial and job-getting role. Stevenson's first-hand knowledge of Italy made a big impact on the Glasgow scene with his Italian Gothic Kelvinside Free Church, quickly followed by Townhead Church on Garngad Hill where the spire was of French inspiration, a development which may have been related to the arrival in the office (c.1862) of William Leiper who had travelled in France and had had experience in the office of John Loughborough Pearson and William White in London. Another outstanding draughtsman, John McKean Brydon joined the practice in the following year (1863) and remained until 1866 when he left for William Eden Nesfield's in London. John James Stevenson inherited a substantial shareholding in the Jarrow Chemical Company on his father's death in 1866. Two years later he withdrew from his partnership with Douglas for what he described as 'an interval in the practice of my profession' travelling and writing the book eventually published as House Architecture in 1880. At the end of it he settled in London in 1870, and late in the following year he formed a partnership with Edward Robert Robson, whom he had known in Scott's office and who had also grown up in County Durham. The break with Douglas was wholly amicable and relations remained close, Stevenson's office becoming the stepping-stone to London for many of the most promising assistants from Campbell Douglas's office throughout the 1870s and 1880s, most notably George Washington Browne, John Marjoribanks McLaren, William Wallace, William Flockhart and Francis William Troup. Together Douglas and Stevenson formed one of the greatest teaching partnerships of mid Victorian times. Like Leiper's and J J Burnet's later, the office at 226 St Vincent Street was a studio rather than just a drawing office and as Campbell Douglas and his wife Elizabeth Menzies, whom he had married in 1865, (she was daughter of Allan Menzies, professor of conveyancing at the University of Edinburgh, and niece of Charles Cowan, MP, who through family connections brought the commissions for Westerlea at Murrayfield and the Cowan Institute in Penicuik) lived upstairs it had a family atmosphere, William Flockhart recollecting 'the musical At homes to which his assistants were always asked … the staff was in turn treated but as a larger family'. 'Quiz' described Douglas as 'a charming host either in town or country [who] sings a good song, and tells and appreciates the finer points of a good story'. With the departure of Stevenson, Douglas was for some years sole partner. Up to 1870 the business of his firm had been almost exclusively churches and large houses, but with the commission for the Scottish Amicable Building, first mooted in that year but not built until 1873, followed in 1872 by that for St Andrews Halls the practice moved into an altogether different league of major commercial buildings and public projects. Douglas's phenomenal success in this field was made possible by the energy and ability of James Sellars, his partner from March 1872, if not earlier. Sellars was born in the Gorbals on 2 December 1843, the son of a house-factor of the same name. He was articled to Hugh Barclay at the age of 13 in 1857, and remained there until 1864 when he joined the office of James Hamilton who had a significant practice in Belfast as well as in Glasgow, and remained there for three years. Thereafter he assisted in several offices until he joined Campbell Douglas's office in 1870. He had earned his partnership by winning the first competition for the Stewart Memorial out of fifty designs submitted in 1870, and 'awoke to find himself famous': and when the result was quashed and the competition re-advertised at half the original outlay he drew even greater attention to himself by winning that competition also on 31 January 1871. He was admitted to the Glasgow Institute of Architects in March 1872, his certificate being signed by Alexander Thomson and John Baird, and in the autumn he took a brief sketching holiday in Paris and Normandy, which he put to good use later. This visit probably related to the presence in the office from 1871 of Charles Alfred Chastel de Boinville, a pupil of A Guyot and an ex-assistant of Geoffroy of Cherbourg who had sought employment in Glasgow in the wake of the Franco-Prussian war. As Chastel de Boinville returned to Paris in 1872 it is possible that Sellars travelled with him. Sellars went abroad only twice: as Lindsay Miller observed 'when young he had not the means, when able no time'. What Chastel de Boinville specifically contributed to the work of the practice in the year or so he spent with it is difficult to establish now, though it is possible that he had some hand in the spectacular French Gothic spire of the Queen's Park Church; but his presence coincided with a radical change in the stylistic direction of the practice in 1871-73. The Scottish Amicable building and the Claremont Street Wesleyan Church had cinquecento detailing, but at St Andrews Halls a monumental neo Greek was adopted. Superficially the design had much in common with Alexander Thomson's work in its uncompromisingly rectangular shapes and banded masonry but it also had an even more direct relationship to the post-Schinkel Berlin School, while much of the smaller detail was markedly French Beaux-Arts, a tendency still more markedly seen at Finneston Church and the Queen Insurance Building of 1877-80. 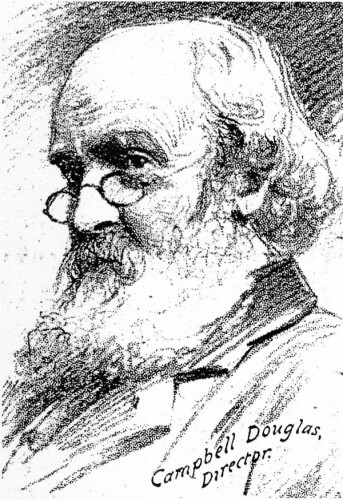 Parallel developments were to be seen in the work of Hugh and David Barclay with whom Sellars retained close links, and it may be that they were the other Glasgow practice Chastel de Boinville assisted in 1871-72, although Leiper's French Beaux-Arts Partick Burgh hall suggests him as an equally likely candidate. These developments in the Campbell Douglas & Sellars and Barclay practices ran counter to those elsewhere in Britain, their only parallels being John Honeyman's library and museum in Paisley of 1868 and James Hibbert's Harris Library and Museum at Preston of 1882, and probably it was the esteem in which Thomson was held in Glasgow which made them possible. Also directly related to Sellars's acquaintance with Chastel de Boinville was the French-roofed New Club and his unexecuted design for rebuilding the Trades House of Glasgow which were wholly of French Second empire inspiration and closer in style to London buildings of the same date. The designs submitted in the two Glasgow Municipal Buildings Competitions of 1880-81 were similarly a fairly pure French Beaux-Arts, Sellars's tendencies in that direction probably having been encouraged by the success of the Burnet practice following J J Burnet's return from Paris late in 1877. More individual, though still with French-inspired details, were the Glasgow Herald Building and the giant City of Glasgow Bank buildings of 1878-80 where giant Corinthian orders were combined with pedimented attic features of which were probably of J J Stevenson/E R Robson inspiration. Throughout this period Douglas's design role is unclear, though he probably determined the general direction of the practice while acknowledging that the elevations were the product of Sellars's 'fertile brain and facile pencil', A N Paterson observed that at least in the earlier years of the partnership the drawings bore many annotations in Campbell Douglas's handwriting. Douglas's practice took a further step in a Beaux-Arts direction when John Keppie, a draughtsman who worked closely with Sellars was encouraged to attend the Ecole des Beaux-Arts. Born in 1862, the son of James Keppie a wealthy tobacco importer with houses in Hillhead and Prestwick, Keppie was educated at Ayr Academy. He was articled to Campbell Douglas & Sellars c.1880 and, unusually, attended classes at the University of Glasgow as well as at Glasgow School of Art. His dossier at the Ecole des Beaux-Arts is missing but he appears to have joined the Atelier Jean Louis Pascal in 1885 and remained there until at least the autumn of 1886 when he travelled in Northern Italy. He was a fine watercolourist and had remarkable success in the Tite prize competitions, winning its silver medals in that year and again in 1887. He returned from Paris to the Campbell Douglas & Sellars office without completing the course in order to assist Sellars with the firm's entry for the Glasgow International Exhibition of 1888, the competition for which had been advertised in January 1887 and was won on 31 March 1887 with a weather boarded design with galvanised metal domes in a Moorish, probably basically French colonial, idiom. In the 1880s Sellars became influenced by the work of Rowand Anderson, probably through Campbell Douglas & Sellars's continuing friendship with George Washington Browne. Interest in the early Renaissance work of Anderson and Browne showed first at the octagonal Free Abbey Church in Dunfermline in 1881 and progressed through Scots Renaissance and Scots Georgian influenced designs to the competition design for Renfrew County Buildings, close in design to Anderson's Edinburgh Medical School, and Anderson's College of Medicine in Glasgow which mixed Early Italian Renaissance and later Scots seventeenth-century motifs, both of 1888. Sellars's death was a direct consequence of the Glasgow International Exhibition. Campbell Douglas took severely ill and was unable to come downstairs to the office for months. James Barr, Sellars's civil engineer co-adjutor recorded that 'twenty-two hours' arduous and unremitting toil was no unusual event'. At the exhibition site a rusty nail pierced his boot causing an injury that failed to clear up and was neglected from want of time. He saw the exhibition through to the opening on 8 May and was offered a knighthood which he declined, probably out of deference to his senior partner, observing that 'he couldn't live up to it': Sellars had in fact always adopted a lower profile than his senior partner, preferring not to become a Fellow of the RIBA along with Douglas when the latter was admitted on 9 June 1879, his proposers being the elder Burnet, Charles Barry Junior and his old colleague R J Johnson. The final accounts occupied Sellars for the whole of the summer and were a struggle against failing health, which a holiday in the West Highlands was too late to improve. He died of blood poisoning at his house, 9 Montgomerie Crescent on 9 October and was buried on the 11th at Lambhill where a very Greek memorial by Keppie marked his grave. A portrait of him by Georgina M Greenlees is in the Glasgow Art Gallery collection. After Sellars died, Campbell Douglas's practice gradually dwindled. Keppie formed a partnership with John Honeyman at the beginning of 1889 and by agreement with Campbell Douglas he took Anderson's College of Medicine with him as a setting up commission. Douglas retained the other work of the practice and took into partnership the less talented but very competent Alexander Morrison, one of his leading draughtsmen. The matter was handled discreetly and nothing of what this unusual arrangement was about became common knowledge. Honeyman had, however, been more seriously affected than most by the slump in business after the failure of the City of Glasgow Bank. Family illness - his second wife and sons had consumption - and living up to his ship-owner in-laws had drained his finances almost to the point of bankruptcy. Campbell Douglas seems to have encouraged the move to rescue him, in the knowledge that the Keppies had the money to re-found the practice. Initially the practice of Campbell Douglas & Morrison had a fair degree of success, winning the competitions for the public libraries at Ayr and Perth and coming second to Dunn and Findlay at the Adam Smith Memorial and Beveridge Halls at Kirkcaldy. Their work was refined in detail if unadventurous. Recovered in health Douglas resumed his high public profile contributing a paper on 'The Architectural Education of the Public' to the Edinburgh meeting of the National Association for the Advancement of Art in 1889. It sets out his philosophy, includes a moving tribute to Alexander Thomson and gives more than a hint of his Free Church radicalism. He was active in both the Glasgow Institute of Architects and the Glasgow Architectural Association, of which he was three times President, and was a council member of the RIBA, becoming Vice President in 1891. His other interests were foreign travel and botany: and he was a prominent advocate of the merits of cremation. In 1901 Campbell Douglas 'found it necessary' to dissolve the partnership with Morrison who disappeared from the post office directories in 1906 after a few years of unsuccessful practice from his home address. The problem is said to have been Morrison's addiction to drink. But by that date Douglas was, at seventy-three, too old to carry on the practice alone and he merged it with that of Alexander Nisbet Paterson within two years. He took little active interest in the design side of the practice thereafter and a bad recurrence of a previous illness - presumably that of 1887-88 - caused him to retire to Edinburgh in 1906. Aside from his architectural practice, Campbell Douglas was active in public life. He was a Justice of the Peace for Argyllshire, and was a member of the Scottish Liberal Club, the Liberal and University Clubs, Glasgow and the National Liberal Club, London. Campbell Douglas died of a bladder disease on 14 April 1910, leaving what was then the substantial sum of £8,023. John Rhind c. 1854 1860 Assistant(?) Probably initially an apprentice, then an assistant. 1874 Scotia Music Hall, tenement and shops Glasgow Scotland Rebuilding of Black's theatre, £15,000. Known then as the Scotia Variety Theatre, and tenement added in front. 1903 Clyde Street School Helensburgh Dunbartonshire Scotland Begun by Paterson but completed in partnership?